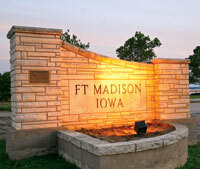 The city of Fort Madison would like to welcome all our visitors and guests to our amazing town. We are extremely proud of our community, as well as the wonderful people who make it such a great place to live, work and visit. Fort Madison is the location of one of the most breathtaking views of the mighty Mississippi River. Along our shoreline lies the replica of the original Fort Madison, a newly-restored train depot, our historic museum and the world’s largest double-decker swing span bridge. Along its backdrop are beautiful historic buildings still in use today as retail stores, restaurants and hotels, each with its own unique story to tell. These amazing architectural pieces are but a few of the beauties that both homeowners and business owners take pride in. Fort Madison also offers a number of recreational activities, including walking trails, bike trails, fishing and boating on the Mississippi River, as well as a number of town parks equipped with picnic tables and playground equipment, perfect for family activities. Join us as we celebrate different events throughout the year. The new year begins in Fort Madison with magnificent bald eagle watching in mid-to-late January. We gladly usher in spring with our annual Main Street BBQ competition, which brings grillers from all over the tri-state area and sometimes beyond. Our annual Fourth of July fireworks display is a wonder of colorful explosion in the sky above the river. Balloons Over the Mississippi fills the sky with the excitement of hot air ballooning. The Tri-State Rodeo in September brings the cowboy and cowgirl out in all of us. The Mexican Fiesta is a cultural and culinary must, and the Parade of Lights during the Thanksgiving weekend showcases the beauty that Christmas Lights can create. These are but a few of the exciting events that Fort Madison offers throughout the year. We are happy you have chosen to visit our lovely city, please keep us in mind for future trips. We pride ourselves on hospitality, and our doors are always open to you!